I had kind of wanted to go and see The Princess and the Frog when it was in theaters. It's been a long time since I had seen a (good) Disney animated film and the clips I saw were funny - and raised questions. I had a feeling that the movie could be great! My only concern was how deep Disney planned to dive into black magic. So I figured I'd wait to see it on video and hopefully learn about it from other people who might have seen it before me. But I didn't see any reviews pop up and so, finally, I decided to watch the movie for myself. Having read the book, I went out and rented The Princess and the Frog and after we tucked our children into bed, Jonathan and I watched the movie. As you might suspect - the movie has relatively little to do with the book. The film follows waitress and aspiring restaurant owner Tiana as she tries to fulfill her late father's dream in 1926 New Orleans. Despite her mother's worries, Tiana remains single minded in opening "Tiana's Place," working two jobs to save enough money to secure the ideal building for her restaurant. Meanwhile, Prince Naveen of Maldonia has arrived in New Orleans determined to better his financial situation. After being cut off by his parents, Naveen is forced to marry a rich southern belle to maintain his lifestyle. It soon becomes obvious that Tiana's best friend and the rich sugar baron's daughter, Charlotte LaBouff, is the perfect candidate. Lurking in the shadows is the voodoo witchdoctor Dr. Facilier. Angry at the neglect he receives from the rich and powerful, Facilier ropes the money-hungry Naveen and his emotionally abused valet, Lawrence, into a scheme that involves turning Naveen into a frog. Lawrence, through the use of a voodoo talisman, adopts the prince's likeness and sets out to marry Charlotte with plans to split the money with Facilier, who has some shady plans of his own. When the prince escapes and the voodoo charm runs out of his blood, Facilier offers the souls of New Orleans, to his demon "Friends on the other side" in exchange for finding him. You thought I was concerned about the magic in the book? Pshaw! That was nothing compared to what was in the movie! The movie was atrociously bad. Jonathan and I could not believe the amount of black magic that was displayed on the screen - and not even in a "friendly" way. Here's your positive: Disney was very clear that the voodoo magic was causing a great deal of harm and was something that was to be avoided at all cost. They were very good about causing their characters to be rightly afraid of it. I can see how many people would argue that this movie portrayed a Biblical worldview because it painted evil as it is - E.V.I.L. Here's your negative: There was no ray of light, no truth, to counter-attack the evil and defeat it. Instead you had your bad voodoo and your good voodoo. Bad voodoo meant calling on friends "from the other side" which appeared as illustrated demon-spirits who were sent out to search for the frog. Good voodoo was portrayed as a blind woman who wanted to show the frogs how much in love with each other they were. There was nothing good there. There was no accurate portrayal of the good that conquers the evil or the truth which would set any of us free. (See John 8:32 and John 14:6) Instead we were subjected to scenes of the Shadowman calling on evil spirits who lit up (or should I say darkened?) our screen. Scary faces. Howling. Tarot cards. Voodoo dolls and other occult paraphernalia. The word 'hideous' does not go far enough in describing this film. There was a clear worship of evil spirits and, again, nothing to counter-attack. Disney may call this film 'entertainment' but I cannot agree with them. There is no way that I would ever consider allowing any child of mine to watch this film. I frankly cannot believe that this film is marketed to young girls. The Disney Princess are known for being appealing to bright little girls who dream of growing up with tiaras and big fluffy dresses. Scaring the bejeebees out of them with voodoo dolls and demons shrieking in their faces is absolutely unconscionable to me. I cannot fathom the "creative mind" behind this film that thought this would be of benefit to society at large. As I said yesterday - the evil in the world is real and there is an enemy who seeks to hurt, kill and destroy. But there is a God who comes to destroy that same enemy and give us freedom in Christ. God does not make an appearance anywhere in this film. A false god does. A "good" voodoo lady who blindly (literally and figuratively) sings about how it doesn't matter what we look like or what we believe - we just need to 'dig a little deeper' to 'find out who we are'. If I look only to myself to find out who I am, I'm going to come up empty. I'm pretty shallow all on my own. My great worth comes in knowing that I am an adopted daughter of Jesus Christ. God has called me to Himself and made me to know Him. I am a child of God. End of dig. I cannot see that there is any worth and merit in this film from a Christian perspective. It was dark and essentially meaningless in the sense that it presents no answer for the darkness and misery within it. It's both a shame and a disgrace that Disney would elect to set such a film in front of their target audience of young ladies and young impressionable women. I cringe whenever I think about the implications. Am I glad to have seen this film? Well. Yes, actually. Absolutely. I know what it is now. I am aware. And it is not making it's way past my doorstep ever again because it is not amusing, entertaining, wholesome or true. It is imbalanced and incomplete, offering only human goodness as an alternative to evil. Man cannot battle evil alone and win. It is not in us to do. So the movie falls short of providing a Savior or a valid defense. It ends up hopelessly dark and outrageously oppressing. Watching this film leaves the viewer with two choices - go with Mama Odie and find out where our own goodness lies. We can choose our little gods in an attempt to stave off "The Shadowman." Or we can turn to Christ who has conquered evil already. As for our household - we choose Christ and reject this film. Thanks for such an honest and detailed review. I don't believe this movie will be making it's way into our house either! This might sound funny, but I think it's a shame that the first "black" Disney princess is in this movie. I would definitely like my little girl to know more tones of skin color from Disney, but she won't see it in this movie. Thank you, Carrie. I was shocked at how scary this movie was and how it focused so much on voodoo. It really was inappropriate for little kids and won't become part of our DVD library. I appreciate the review of the film and book. I had an inkling the film would be this way from what little I knew of it. Amber - Thanks for your comment. What I do HOPE for is a clear distinction between good and evil. And even the most evil of the Disney villains is usually "tolerable." For example, I think Ursela from the Little Mermaid is a bit edgy, but I can still find reasons to enjoy that movie. Snow White's witch is pretty evil....but no one is trying to fight good evil with bad evil. My concern with Princess and the Frog is that there is no true distinction. There isn't "good voodoo". It's consistently wrong. You can't fight against evil with more evil and expect a happy ending to result. It is not possible. My shock, if you will, comes from seeing exactly how *visually* evil Disney chose to make the film. The images that they used when talking about the "friends from the other side" was quite scary and appalling and, again, I think inappropriate for the young girls the film is marketed to. (There are lots of things that I think adults can and should address in this world that I do not think is appropriate subject matter for young children. They'll have their turn and it's our job to prepare them for their turn. But, in my opinion, preparing them for adulthood, and equipping them with the tools to be discerning for themselves doesn't mean I plunk them down at 2-8 years of age and say, "This is voodoo - cartoonified. It's scary. Bad. Evil. Nasty! Watch it!!" I don't think that they are yet mentally capable of handling the arguments surrounding the film just yet. I'm not interested in hiding my children from the world. They live in it and they will see it. But our policy is that while we are in the world, we do not need to engage with the evil just because "it exists" - and certainly we need to determine for our children when they are ready to handle the arguments surrounding this particular film. We have to use some discernment in determining what is unhealthy for engagement and I think it's appropriate to call it out when we see it. This film, I would argue, is unhealthy. I have no fears related to this film. But I do think it is an unhealthy balance of right and wrong and sends the wrong message - that humans, in their own strength, can conquer evil. And that, I believe, is simply not so. But as for Disney -- no. It wasn't shocking that they didn't mention God. They never do. But He can still be found in story lines because He is Truth. When truth is mentioned, He is there - stated or no. It's inescapable. Personally, I love Disney. Disneyland is one of my favorite vacation spots! Would I boycott them because of this film? No. Will I boycott this particular film? Yes. And I will do so. Thanks for your time and for engaging in conversation. Thanks for this review! Unfortunately, my son had already seen the movie at school. He's 11 and he recognized the voodoo junk for what it really was. I hate to think of the impression this movie has made on children who do not know the goodness and light of God. Now I know not to buy any Princess and the Frog merchandise for my two nieces. Well reviewed. Wish Christians who freak out about movies like (insert name of last movie Christians freaked out about) would get up at arms with movies like this one. Disney's much more in the position to subtly affect our little ones than the obviously pantheistic (albeit entertaining and fascinating and Oscar-deserving) Avatar. I loved reading your thoughts! I have no problem with stories that include evil. But like you, I do have a problem with stories that call evil "good." So for example, I'll read stories with witches, so long as the witches are clearly the baddies (the Narnia books). But I do have a problem if the heroes in a story perform witchcraft. That doesn't jive with Truth. So I had no problem with Dr. Facilier. He's the baddie. He does bad things. And it was AWESOME that his very downfall was precisely BECAUSE he messed with evil forces. The good guys didn't defeat him per se... His friendship with evil was his own undoing. He reaped what he sowed. Bravo! It was the moment Mama Odie was mentioned that I started to get worried. Here it goes, I thought. Bad voodoo vs good voodoo. But... BUT... I was pleasantly surprised that she never actually did any voodoo. Which, again, was awesome! The frogs came to her hoping she would fix things with good magic. But instead she conversed with them. And she tried to appeal to their minds and hearts. In fact, in her song she says that lots of people have come to her looking for magic, but instead she talks to them. Disney had every opportunity to show us "good" voodoo, but Disney chose not to. They deliberately had no "good magic" in this movie. Bravo! In the end, Dr. Facilier is defeated, not by magic, but in part by Tiana's simple decision to do right. He gives her the opportunity to have all her dreams come true by handing over the talisman (reminds me MUCH of Jesus' temptation in the wilderness). But she says no to temptation. Resist the devil and he will flee. Bingo! Awesome illustration of that truth. In the end, Facilier is not undone by competing magic, but by a single girl's refusal to give in to temptation. Bravo! Personally, I'm okay the fact that the frogs didn't try to "battle evil in their own strength and win." While it would have made for an exciting movie (like when Aladdin used his smarts to outwit Jafar), as you point out, it's not true to life. I agree that in real life Christ alone conquers evil. But Hollywood isn't going to say that, of course. But rather than wrongly portray people going head to head with evil, this movie simply had the heroine say "no" to temptation (good! ), and in the end the villain reaped what he sowed (good!). And yes, I did appreciated the fact that in this movie evil was evil was evil. I can't imagine ANYONE wanting to mess around with magic after seeing this film. After Harry Potter came out, I started seeing kids huddled around the wiccan section of B&N. NO danger of that with this movie. The message this film dramatically presented: Stay away from magic! But was the degree of scariness appropriate for 5 year olds? Depends on the 5 year old. Will we own this movie? No. But I thought its message was far closer to reflecting Truth than many, many other Disney movies. Z-Dad- DEFINITELY agree with you (and failed to say so) that Dr. Facilier met a completely appropriate end. I had some lighthearted thoughts during that part of the movie myself! =) I'm really glad you pointed that out and thanks for your comments to that end! Anyway, so the frogs go to Mama Odie and she IS doing magic around them. She just "refuses" to help them, redirecting them with a song about "digging a little deeper" into themselves so that they could discover that the power to defeat the evil and change back into humans lay within themselves. But she's dancing around her cabin and changing her pet snake into various animals and - at one point - has Tiana look into a magical reflective pool of water to see into the past. So it's there. Subtle. But definitely there. So I'd still maintain that "good voodoo" is held up as the "best option" for fighting against "bad voodoo". Disney just cloaked it in a cute little ditty. But I do agree with you and you are VERY right in saying that Disney did a completely awesome job causing Dr. Facilier to be removed in a gruesome and awful way -- which was the only thing that they could have rightfully done with that character. I WAS happy with that. THanks for mentioning it! It's been a while since I saw the movie... was mostly relying on memory. Question for you... How do you feel about magic-making in other Disney movies? I'd forgotten about the shape-shifting pet snake in "Frog." In your mind is that different from what Aladdin's Genie does to Abu - or would both be considered inappropriate? And there's Pinocchio's Blue Fairy. And Cinderella's Fairy Godmother. And the fairies in Sleeping Beauty. Should we just chuck all these movies? Or do you feel they are okay because there's a clear distinction between heroes and villains? I do think the magic in "Frog" feels a bit more dangerous than these other examples, because there aren't actually fairies or genies in the real world, but there certainly are folks who practice voodoo. So while in a practical sense there's not much difference in what "happens" on screen, the mere term voodoo makes it hit a bit close to home. I wonder too -- (and again, I apologize since it's been so long since I saw the film) but when Mama Odie tells them to "Dig a little deeper" -- I wonder if she's simply telling them to be thankful for what they already have. She tells the prince that the riches he's seeking aren't going to bring him happiness (good Biblical advice as well), and Tiana's work-driven obsession isn't going to bring her happiness (also sound) -- those things (appearances, possessions, occupations) are "shallow" or "surface-y." Rather, they need to appreciate the gifts right in front of their noses that they can't see. I think it might be a message of contentment rather than a message of self-salvation. Z-Dad - I LOVE your questions. =) THanks. You're making me think and I'm glad of it. Aladdin - Honestly, I can't remember it well enough. That movie did run through my mind but I can't remember the particulars of it, beyond enjoying it at the time I saw it, thinking Robin Williams was a perfect choice, and laughing a lot. I'm waiting for that one to come out of the Disney vault because Jonathan has never seen it and I'm anxious to show it to him. So...I guess I can't comment on that, specifically, because I do'nt remember it. I think my position though as been more clearly shaped in molded in just the last few years as I've spent more time paying attention to books that deal with magic (i.e., the Narnia series). I read the first Harry Potter years ago and actually liked the first half so I'm feeling pressured to go to the HP series and clarify my arguments a bit more and figure out exactly how I feel about those books and how I think they measure up on creating a clear distinction between good and evil. I LIKE the use of magic in books. I like magical and imaginative tales. But I do really like it defined between good and evil. Yes, I do feel there is a clearer distinction on other Disney films. Take for instance Pinnochio - having now read the book, I recognize that Carlo Collodi wrote that as a moral tale for young boys. Disney had their way with that film also, but I have this original story in my head and can see where Disney made the changes and why. And I still think the movie plays off as a moral tale. Right is clearly right and wrong is clearly wrong. No objections. Fairy tales are a necessary part of life. Magic can be used in a positive way and truth can be cleverly revealed through it in a way that captures children's attention. No objections to the use of it. But in the case of "Frog" I did they think dabbled in something incredibly dangerous and destructive and I can't see that it is healthy. The lines are too blurred. This is a topic I've been very interested in but haven't yet been able to make up my mind. I am very uncomfortable with magic in movies, especially when used for evil. I don't like Harry Potter, didn't like LOTR, or Snow White, etc. Narnia... is a gray area for me. I LOVED the first movie (and have read all the books). The second movie made me a bit squeamish when the white witch comes to tempt Edmund. And I can't decide if I'm going to watch the third movie. Thanks to your post, I'm now aware that there is a trailer and it looks like it's dabbling in even more magic than the first two movies. "Let no one be found among you who sacrifices his son or daughter in the fire, who practices divination or sorcery, interprets omens, engages in witchcraft"
"They sacrificed their sons and daughters in the fire. They practiced divination and sorcery and sold themselves to do evil in the eyes of the LORD, provoking him to anger." "He sacrificed his sons in the fire in the Valley of Ben Hinnom, practiced sorcery, divination and witchcraft, and consulted mediums and spiritists. He did much evil in the eyes of the LORD, provoking him to anger." So are we to take the stance that it's okay to watch as entertainment, but not practice any of it? Is this command against divination, sorcery, and witchcraft only applicable to Israel or does it still hold true today? In your last comment, you said "Magic can be used in a positive way and truth can be cleverly revealed through it in a way that captures children's attention." - Are you meaning it can be used in entertainment in a positive way or in real life? There are no examples of magic in the Bible that were used by God's people, only miracles performed by God Himself through His servants (Moses, etc). Just some thoughts and questions. :) I'm still trying to decipher this one out for myself. Cassandra - Thanks for your response as well. Good thoughts to chew on for certain! Thanks for the review. It's about what I expected from what I've heard, but I always like to hear it from someone that I know where they come from (or however that should be worded). I saw this movie on Netflix instant download and was so disappointed because it had some things in it that were nice messages (wait and I'll list them), but you absolutely can't own this movie and let your little girls watch it because of the horrendous black magic all over the screen. It was, quite simply, creepy in spots. I don't watch horror movies because I don't want evil images in my head and I had to turn away when those black spirits started floating all over the screen...and they expected this to be for kids? 1. The rich young lady was GOOD friends with the poor young lady and she valued their friendship over getting the guy, over looking prettier, over money. Wow. How great! She loaned her a beautiful dress to wear when she might have been vain and not wanted competition, she cared more about her friend's comfort than whether her guests had the perfect desserts served to them, and she was willing to give up her dream of the prince for her friend. 2. Color was never an issue for any of the main characters (at least to my recollection). Another good message. 3. The prince and (frog) princess were willing to sacrifice all for their friend. Good message. 4. Tiana works hard for her family, and to make the dreams of her (deceased)father come true. Hard work is a good message. Dreaming is a good message. Respecting your parent's dreams is another. I am disappointed that Disney muddied the waters of this potentially excellent portrayal of friendship with black magic...if the script was so dark, they should have rewritten it so they could have kept the positive messages accessible to all viewers. A pity this one won't be on our dvd shelf. I thought Tiana and her dream of cooking, and making her father's dream come true, was sweet...and I loved her selfless friend. I see what you're saying, but I have to bring a different light to the discussion. It's a movie! I'm not trashing you, here. Each parent is entitled to their own methods and opinions, and I'm sure not everyone agrees with my views, either. That said - I make sure my children go into watching any movie, knowing that it's pretend. 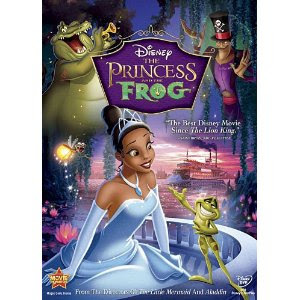 I thought Princess and the Frog was a beautiful, fun story, that taught a great lesson. Tiana has become my older daughter's favorite Disney character, and we listen to the soundtrack on the way to school every morning. What I'm trying to say is I don't think there's a lot of point in sheltering our children from stories. So many of my fellow Christian parents don't let their children read Lord of the Rings, or Harry Potter, for the same sort of reasons. I think it's tragic that kids will miss out on the classic literature (and even the fun loving Disney movies) that helped to shape my life and make me the mother and artist that I am. I hope you're not offended, but I felt I needed to speak out.